As this blog does require recipes that I record of my mother’s cooking or sent in by others and I also wish to be a bit more active on my other blogs, I will be making weekly or bi-weekly posts rather than daily posts as I did in the first few months of this blog. 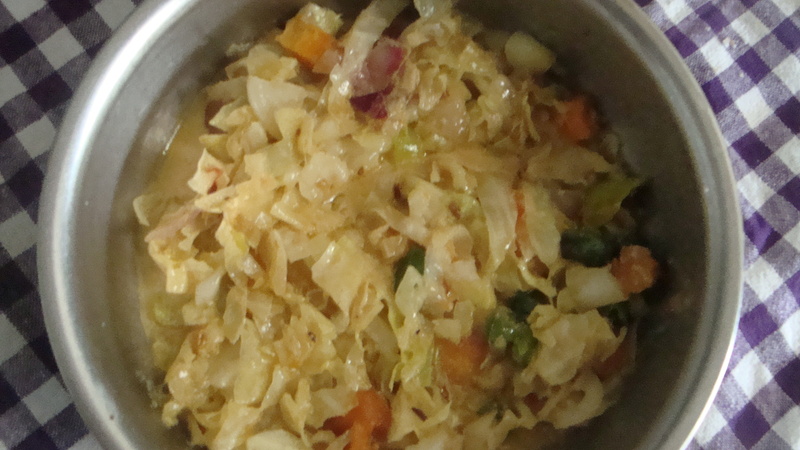 This weekend’s recipe is that of my mother’s spicy cabbage curry. If you prefer fried cabbage, try out the delicious cabbage fry or the cabbage and carrot fry recipes posted earlier on this blog. Heat a tbsp oil in a pan and fry the chopped onion, garlic, capsicum, chilli, curry leaves and fenugreek seeds for a couple of mins. Then, add the shredded cabbage and optional carrot to the pan and continue stir-frying for around 5 mins. Add the coconut milk, curry powder and salt, to taste and let the curry cook for around 10 mins. Remove the pan from the stove and mix 1 tsp lime juice into the pan. 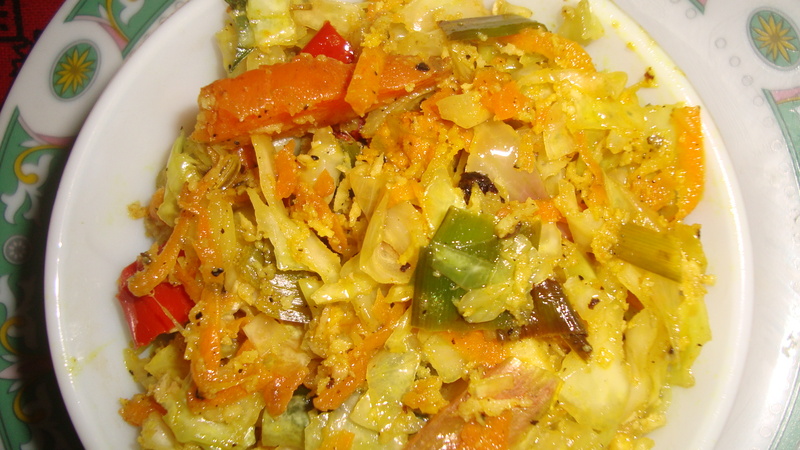 Clean and wash the cabbage and add salt and turmeric to the shredded cabbage. Heat a tbsp oil in a pan and fry the chopped onion, ginger, garlic and fennel seeds for a couple of mins. Add the cabbage and carrot to the pan and stir fry for another 7 – 8 mins. Add the freshly scraped coconut, mixed with a pinch of turmeric, and crushed chillies. Stir fry for another 5 mins. Make a small hole at the top of each capsicum and remove the insides of the capsicum, which you can discard. Keep the hollow capsicum. Boil the ash plantains. Remove skin and keep the skin aside for a peel salad. 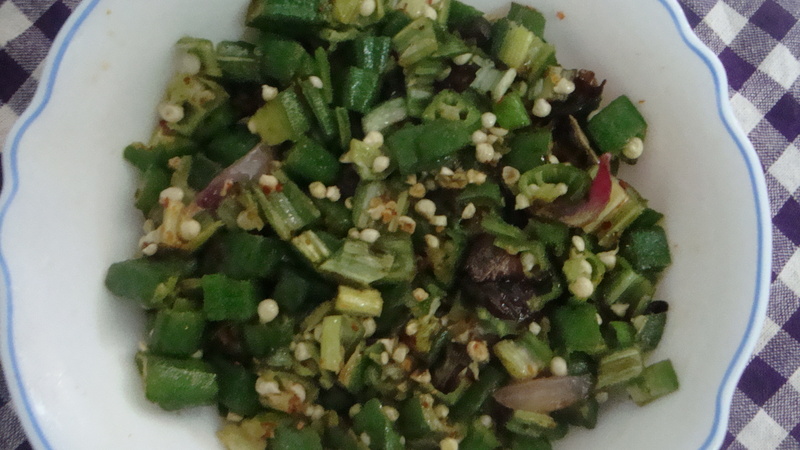 Chop up or mash the boiled ash plantain (sans skin) and mix with the chopped onion and chillies and fennel seeds. Lightly sauté the ash plantain mixture, adding salt and pepper to taste. Fill the insides of the capsicum with the lightly sautéed ash plantain mix and keep aside. Make a batter by mixing the wheat flour, salt and water. The consistency of the batter should be similar to that of a pancake batter. 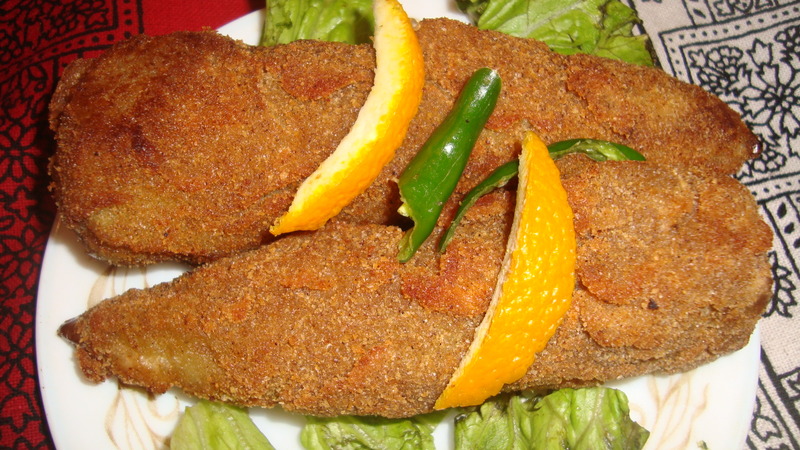 Dip the stuffed capsicum in the batter and roll it in bread crumbs. Repeat the dipping in the batter and rolling in the bread crumbs for a double coating of the stuffed capsicum. Deep fry the stuffed capsicum. For those who prefer non-veg, substitute ash plantains with tinned fish (pilchard or salmon).